This is a hard thing to remember sometimes. Even youths will grow tired and weary. For years, I felt like Stretch Armstrong trying to keep my arms wrapped around a family falling apart. In the beginning it was a whirlwind. All I cared about was getting my husband the appropriate medical care, the right doctors to fix whatever was broken. Then years later, I am looking at a husband who works strenuously to keep himself under control, an angry teenager, a depressed daughter and my young son who has no idea that dad changed at all. Oh and me, completely exhausted and not able to recognize myself in the mirror anymore. For my youngest son, it was the easiest. He didn’t see dad go to his baseball games, take him fishing or on a bike ride. So the new dad never wanting to leave the house was ok. Sure he got angry, but it wasn’t too bad. He doesn’t remember the powerful outbursts and raging fits that happened when he first came home. Regrettably, my two older kids remember i! t all too well. Words were shouted at them in anger, and unfortunately their dad doesn’t remember most of it. My husband fought so hard to get treatment and it was very difficult to come by, and that is why I stayed with him through it all. Debatably, putting the kids through some horrific fights filled with screaming and hurling objects. My husband was going to any counselor, psychologist and psychiatrist he could. We were going to marriage counseling, but the kids had nothing. I was so consumed with fixing what was broke; I didn’t see what was falling apart right in front of my eyes. My kids were hurting. Instead of beating myself up over the kids’ emotional neglect, I became just as obstinate and stubborn over mending them as I did my husband. My first step in this direction was recognition. Telling the kids, I see what has happened and I know they are in pain. The hard part, after this omission was not letting them get away with murder. I, also, had them evaluated by a counselor. Honestly, she just told me they seemed more grown up then most kids. I didn’t accept her pacified! conclusion. I knew there was much more going on though, especially, with my two teenage kids. My next move was really penciling in time for them. This is still difficult. Time is always my enemy. It never seems like there is enough. The absolute best move we made though was getting them into a church. Not only, did they have great counseling with the pastors, they had mentors. These mentors for my teens, served as their big brother and sister. It really encouraged the kids to talk, talk and talk some more about everything. It radically changed their perspective. The last step to transforming the family is taking care of me. It is so important for me to stay healthy, mentally balanced and emotionally available for the kids. It is utterly exhausting to hold my Stretch Armstrong pose around my husband and kids. Sometimes, I need to let go and take care of myself, before I snap. Getting connected is the best advice I can give. It seems so hard, because it’s one more thing to do. Attending events or gatherings is difficult and I absolutely hate making plans, just for them to fall apart at the last minute due to PTSD moments or my husband’s health issues. Either my husband won’t go with me or I can’t leave him home if he’s feeling anxious or angry. It’s nice though to be able to go online a chat with someone. I can do it in the middle of the night, because there are women just like me going through the same thing: sitting up, late at night, alone, can’t sleep, stressed with the weight of the world on their shoulders. Family of the Vet has really helped me connect with some amazing ladies. I can’t thank them enough. Please make time for yourself and connect. Thank you for sharing! 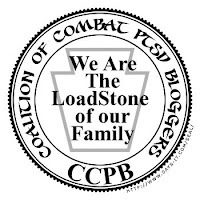 I'm still very new to being the wife of a combat veteran with PTSD, but this was my life a few months and I just wanted to scream and crawl under a rock because I felt like I was "losing" control of "our lives" to something I barely understood.